Mangaluru, Jan 26, 2017: He has been on the Bharat Paribhraman for 11 years to spread awareness on protecting the environment, conserving greenery and harvesting rainwater. So far, he has visited 20 States, covering approximately 60,000 km. Anbu Charles, 59, from N. Pudupatti village in Namakkal district, Tamil Nadu, uses pedal power of his bicycle to spread the message of environment protection. He was in Mangaluru on Jan 24, on his way to Mumbai, central India and the North-East before finally reaching Bhutan. He has been on the ’Bharat Paribhraman’ for 11 years to spread awareness on protecting the environment, conserving greenery and harvesting rainwater. So far, he has visited 20 States, covering approximately 60,000 km. 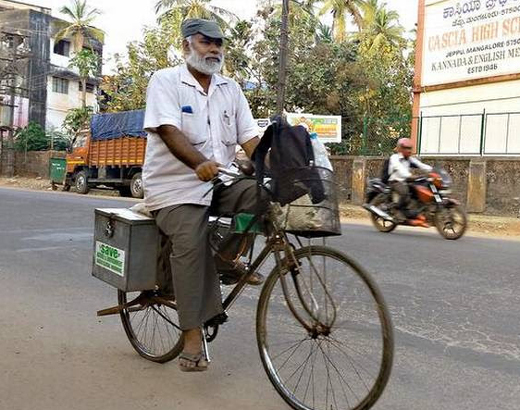 On an ordinary old gearless bicycle that holds two boxes to hold his belongings, Anbu Charles halts en route at temples, churches, dargahs and the like. He relies on the generosity of the public to take care of his needs. “My aim is rural areas and people. Interacting with villagers is vital, they need awareness more. The educated urbanites, are aware of the ill-effects of polution and global warming,” he said. Riding about 20 km a day after starting at around 8 a.m., he visits one or two schools and interacts with the students. The 2004 tsunami was the trigger for his mission, Anbu Charles said, adding that only through conservation can the scourges of nature be prevented. He said a majority of farmers are still unaware of the benefits of rainwater harvesting and are still engaged in extensive digging/sinking of wells. The third world war, if it happens, would be for water only, he said. So far, he has visited Kerala, Karnataka, Andhra Pradesh, Maharashtra, Gujarat, Rajasthan, Haryana, Nepal, Uttar Pradesh, Bihar, Chhattisgarh and Jharkhand. In 2007, he was abducted by Maoists at the Bihar-Nepal border after they suspected him to be a police officer or informer. The literature and certificates he was carrying helped him get released. He added ’Anbu’ means ’love’. He urged the urban populace to have car- and bike-free days at least once a month and use public transport. People should shun personalised modes of transport and use more public transport or non-motorised transport, he said. Wonderful, It is a good way of making aware to the public but toughest task of Anbu. This is the best way of creating awareness among the people. Now all are addicted to modern modes of transport.